We were relieved to be in Samarkand, not only because of our border crossing fiasco, but also because, unlike Tajikistan, we actually had a list of 'tourist sights' to visit. And, we could find relatively cheap accomodation. Our guesthouse in Samarkand was a great deal (at least it felt like it coming from Tajikistan), we had our own room with breakfast for about 10$, and for 1$/each we could join in on the communal dinner with pretty much all the other backpackers in Samarkand. The family that runs the place seems in tune with budget traveller's needs and were extremely organized. Breakfast included coffee, which was good for keeping Yann in a good mood (but became his criteria in Uzbekistan for judging whether other breakfasts were good value). 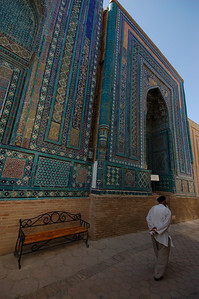 Samarkand is probably the most well-known Uzbek city, if you can say that any Uzbek city is well-known. It was the capital of the warlord Amir Temur's empire (which covered most of Western and Central Asia) and the city is packed with huge, beautifully monuments dating back to the 12th century. 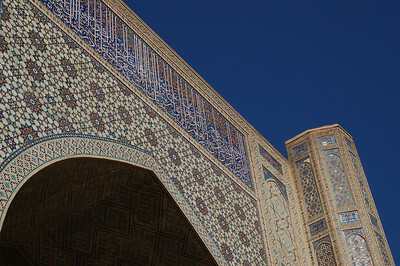 Their signature characteristic is the blue and turquoise tile work that adorns them. 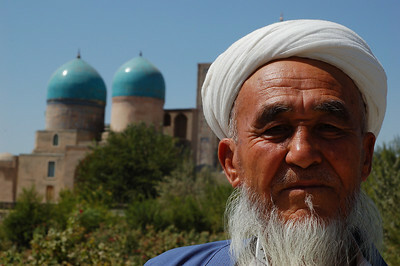 The most famous of the Samarkand sights is the 'Registan' i.e. the central square, where three giant medressahs face each other. Our guesthouse was just a few minutes walk away from it, and despite seeing it many times it was always impressive. We didn't manage to get the classic photo of the three medressah gates, due to the exceedingly tacky stage left over from the previous week's music festival. We went everyday in the hope that the stage would be dismantled, but it seemed like only one plastic gold coloured flag was removed everyday. We also paid a guard to let us climb up to the top of one of the medressah minarets. Entering an off-limits part of the complex, you could see how much the inside of the building was falling apart, only the tilework and domes seem to have been restored. The next Samarkand 'must see' was the Shar-i-Zindah, a complex of mausoleums of important people, the most important being a cousin of the prophet Mohammed. The tile work on the mausoleums was definetely the most intricate and beautiful of any of the larger monuments (it was my favourite of the Samarkand sights). Many old pilgrims climbed shuffled around the mausoleums saying their prayers and the place didn't seem to be as over-run by tour groups as the Registan, although I'm sure they were on their way. It had been a long time since we had seen package tour groups, actually we hadn't really encountered them at all, other than in China where we met hundreds of them (full of Chinese people). Now we were encountering dozens of 'Silk Road' tour groups, mainly French, a few Italian. The French tour groups loooove Yann and I, and many followed us around asking us various questions about travels, instead of listening to their own tour guides. We didn't leave the city without also visiting the Bibi-Khanym mosque, with its absolutely immense turquoise dome and Gur-e-Amir Mausoleum, the family mausoleum of the Timurid dynasty, both within walking distance from our guest house. A few hours away from Samarkand is Shakrisabz, the birthplace of Temur. There isn't much left in terms of epic architecture, other than the ruins of his most ambitious project, Ak-Saray Palace. 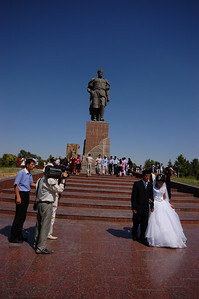 More recently a giant statue of Temur has been erected at its base, and it is swarming with wedding parties posing for photos. When we were there we counted twelve couples queued up waiting for their turn with the statue. Since independance, Lenin and Marx statues have been replaced by the great Timur, in what appears to be somewhat of an artificial attempt at forging an Uzbek national identity. 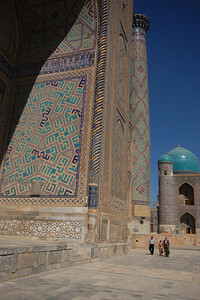 The mosque and the mausoleums nearby were however, almost deserted, which was a great contrast to Samarkand's sights. Mathieu and Myriam ended up in Samarkand with us, after having spent a few days longer in Tajikistan than us, so we had one last dinner together with them at a fancy restaurant (ok, fancy for us, we spent a whole 12$) which we found out later was owned by the former Samarkand chief of police (we didn't let it spoil our dinner). Being Uzbek residents and frequent visitors to Samarkand, Myriam and Mathieu gave us tips on a local market in a town nearby called Urgut, where supposedly all the tourist stands in Samarkand stock up on their merchandise. We visited the market and were completely overwhelmed by the size and crowdedness of it, not to mention the ladies literally chasing us around the place trying to sell us various wall hangings and other tourist items. We ended up with a melon and two keychains. We managed to book our own train tickets out of Samarkand, despite the best efforts of the nasty bleached blond haired Russian lady at the booking office. She was so scary that we handed over a handful of money without actually knowing what we were purchasing (other than the destination). We knew we were heading to Nukus, when we got the tickets we saw that the date was correct, and we hoped we were travelling in sleepers.